The holiday season is one of the most active travel periods for marching bands, with performance opportunities at holiday parades and events held in conjunction with college football bowl games. If you're not lucky enough to be going on a band trip this year, or you didn't get prime tickets for the Rose Parade, you can at least catch some of the parades on television or online. Marching.com has compiled this guide to major 2018/2019 parade events along with television broadcast schedules. Television: Live coverage on PACTV.org (Plymouth Area Community Television) and the HERE Boston streaming app. Look for 11 marching units including alumni drum and bugle corps from four states. Television: Live coverage on ABC7 Chicago at 6:00 PM and rebroadcast across the country throughout the holiday season. Look for six marching bands plus Mickey and Minnie Mouse. Television: Live local coverage on 6 ABC, plus regional coverage on various stations. Live online coverage at www.6abc.com. Features 23 marching bands plus giant balloons and celebrities. Television: National telecast airs on NBC at 9 AM in all time zones. Look for 12 marching bands, including three powerful university bands from CA, OH and VA.
Television: Streamed live on WBTV.com at 9 AM. Airs on WBTV Channel 3 at 4PM. Look for bands, floats, balloons and performances in the Southeast's largest Thanksgiving Day Parade. Television: Live coverage on WGN9, WGN America and online at WGNTV.com. Features marching bands and giant balloons. Television: Airs live on KHOU11 at 9 AM and repeats at 10 AM. Look for high school and university marching bands plus 19 balloons. Television: Live coverage on local NBC affiliate KTSM Channel 9. Look for marching bands plus numerous floats and equestrian units. Bands from the mainland join local bands from the islands for the oceanfront procession along torch-lit Kalakaua Avenue. Television: Airs December 15 on The CW network, December 25 on the Hallmark Channel, and other local stations nationwide. Look for 12 marching bands plus numerous celebrities including grand marshal Nancy O'Dell. Television: QVC Home Shopping Network broadcasts live during the parade and airs portions of the parade on Christmas Eve and Christmas Day. 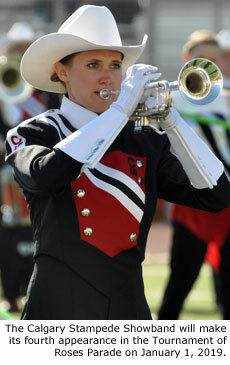 Look for 23 marching bands competing for $5,500 of prize money. Television: Airs live on WKRN News 2 and WKRN.com. A highlights version billed as the Nashville Holiday Music Special airs nationwide throughout the holiday season. Look for marching bands, balloons and celebrities including Kid Rock and LeAnn Rimes. Television: Airs live on NBC affiliate KMIR in Palm Springs. Features lighted floats, balloons, celebrities and marching bands. Television: Check local listings for broadcast times. Features unique citrus floats, high school bands and the university bands representing the Citrus Bowl teams. Look for high school and university marching bands plus cheerleaders, mascots and classic cars. Television: Live local coverage on 3TV and a webcast at www.azfamily.com. Look for marching bands plus colorful floats and giant balloons. Television: Live coverage on Fox Sports 1. Billed as America's largest balloon parade, look for more than 20 balloons along with marching bands and drill teams. Television: Live coverage on multiple networks including HGTV, ABC and NBC. Features 22 marching bands including bands from Canada, Costa Rica, Japan, Puerto Rico and Sweden. Bands also perform in the Tournament of Roses Bandfest December 29-30.